We are specialists in the design and small batch manufacture of cylinder head gaskets, seals as well as high performance Coopers Rings. Our company production facilities cater for cars, motorcycles and stationary engines, with most of our focus on high performance and vintage/veteran cars. Although we regularly produce our products for Aston Martin, Alfa Romeo, Ford, Jaguar, Lotus, Porsche and Rolls Royce, we can cater for any make of engine. 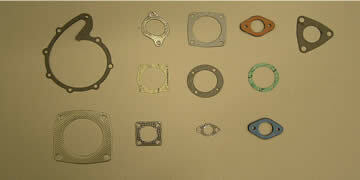 So whether your need is for commonly-produced gaskets, or something completely out of the ordinary, we can help you. Our operation includes fully equipped gasket design services and specialised presses and ovens. The company carry stocks of materials to suit almost any application, and our lifetime expertise in the design and development of gaskets ensures a flexible, high quality service for anyone with a specialist requirement. So if you want a reliable, capable company then you should contact us to find out what we can do for you. Our Sister company Heritage Gaskets holds stock of a range of Payen cylinder head gaskets & manifolds for cars, agricultural, marine and stationery engines. So you can be sure that every product we produce is of the highest quality. 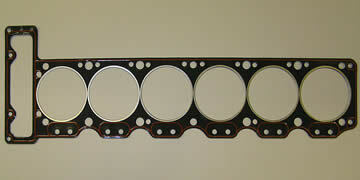 Click for more about cylinder head gasket from Atlas. 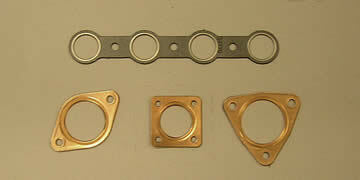 If you need an exhaust gasket that does the job properly, we can provide it. 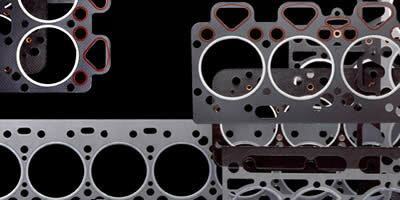 Click for more about manifold gaskets from Atlas. It is very difficult to find a manufacturer of high quality soft gaskets because many companies do not use tested component materials. So many people are forced to re-use mechanical seals well beyond their intended life, or even make their own. Both options carry unacceptable risks with highly expensive engines. At Atlas, we have the tools, and the experience, to deal with even the most obscure requirements. Click for more about soft gaskets from Atlas.